Is your privacy impo rtant to you? And if so, are you running your own mail server? Good. But if your concern is to keep Google’s tentacles out of your personal conversations, that’s not enough. Benjamin Mako Hill published a fine project he undertook over the weekend. He wrote a bunch of scripts to check how much of the mail in his archives had gone through Google’s servers. The answer: About 57% of the mails in his inbox had been delivered by Google. That’s still a conservative calculation, and it’s pretty depressing for someone who goes to the length he does to keep his data private. Mako’s work inspired me to do the same. It was late and I was tired, so instead of futzing around with Python and R, I decided to simply use the tool I had available anyway, and rely on Mutt’s limit patterns. The archives I analysed go back to September 2009 – not quite as comprehensive as Mako’s own, but still significant. which translates to “show me all messages that have the string ‘google.com’ somewhere in the header”. Out of 140,819 messages, 15,746 matched the pattern. That’s 11.18% – much lower than Mako’s share. Why is this? Besides the fact that I run my own mail server, the reason is probably that most of my email concerns my work as FSFE’s president. I exchange a lot of mail with FSFE’s staff and volunteers, most of whom use @fsfe.org addresses. These addresses are just a redirect that people can point anywhere they like (hey, if you want one, you can become a Fellow, and support FSFE’s work!). The figures above don’t include most public mailing lists that I subscribe to. So I took a look at those, too. Here, I was expecting the share of mail that passed through Google’s servers to be higher. It turns out that the opposite is true: From January 2012 to today, I received 46,163 messages in this folder. Of these, 2,547 have the string “google.com” somewhere in their headers – that’s just 5.52%. I’m happy to admit that I’m not entirely sure about the methodology. Feel free to criticise and suggest improvements in the comments! The upshot is that yes, hosting your own server – or keeping your mail somewhere other than the big web service companies – is an important component in reducing your data exhaust. But the size of that reduction depends on the providers used by the people you usually talk to. 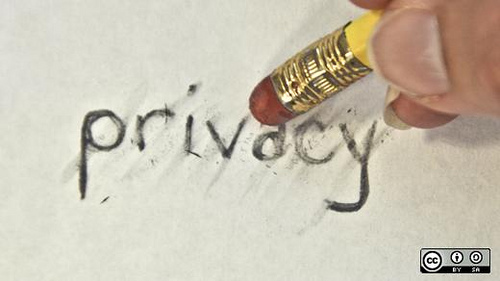 Privacy, as Eben Moglen highlights, is an ecological issue. What share of your mail goes through Google’s servers? Post your figures in the comments. First, as you pointed out, much of your inbox is your work email. My analysis was only my personal email. Since I don’t run the organization I work at, I don’t get to choose the mailserver that handles my work mail. My employer does mandate the use Google Apps although it is an option. If they did, including my work email would make the number go up! Either way, because this was out of my control, it didn’t matter for the point I was trying to make about running my own server so I did not include those emails. Second, my 50+ number comes from emails I replied to, not all emails in my inbox. I receive many emails that are automatically generated from servers, spam, confirmations from retailers, banks, etc. As I say in the post, the number of all messages in my inbox from Gmail is closer to 1/3. Still, it’s much higher than yours. Finally, there are huge issues with selection and I expect there will be lots of variation. I’vre seen 4 people run my scripts. In each case, their numbers were more than 70% and one had more than 80%! It seems like you are doing pretty well but I would be interested in seeing what your numbers were if you ran the same scripts. A few other suggestions: From what period did you include email? Gmail didn’t exist before 2004 and was invite only until 2007. If you have email from before 2005 or 2006, the numbers will be skewed down. Also, it’s important to include gmail.com and googlemail.com in the headers. Today, all mail is delivered from google.com servers but initially the mail did not leave the gmail.com and googlemail.com domains. All of these things will push down your number. Whoops. I missed your description of the period. Thanks for taking a look at this and providing feedback! All very valid. I’ll try and find some time to run your scripts! Since that might be a while, I had a quick look at what happens when I limit the analysis to mails that I’ve replied to. In that case, using Mutt limits ~Q (“mails that I’ve replied to”, for the total) and ~Q ~h google.com (“mails that I’ve replied to, and that have google.com somewhere in the headers”), the result is that 12.59% of those mails have passed through Google’s servers. That’s just a minimal increase. messages sent to servers at these domains. So that’s about 34% gmail. Using the ~Q and ~h mutt limits and using notmuch based queries. I’ll try out mako’s scripts and share the results.